There are as many combinations for pizza toppings as there are stars in the sky. You can be traditional, go really crazy... whatever floats your boat. The sky's the limit, and the beauty of building your own pizza is that you can completely customize it to your liking. Joey is pretty traditional and given the choice will almost always choose pepperoni and mushroom. I on the other hand, like to get creative and top my pizza with "weird" toppings. Like steak, goat cheese, and balsamic vinegar. Or strawberries and goat cheese. Or eggplant and ricotta cheese. We both liked this combination though. 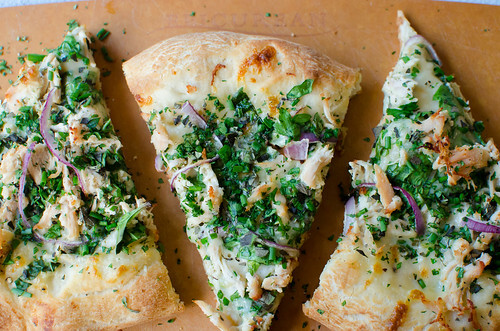 You start with a simple white sauce, then top it with shredded chicken, sliced onions, and a little mozzarella. After cooking, a big handful of fresh herbs is scattered over the top. And might I suggest dipping the pizza in the extra white sauce? This pizza falls somewhere in the middle when it comes to crazy vs traditional. White pizza is pretty standard in my opinion, as is the addition of chicken to pizza. However, adding a boat load of fresh herbs just before serving is a little nontraditional. Yet surprisingly delicious. I'm sure we all get stuck in a dinner rut from time to time, but when you have so many options for pizza, you should definitely never get stuck in a pizza rut. This one is a little different, yet still familiar. Feel free to mix up the protein and use sausage, shrimp, or just leave it off and make it vegetarian. Trade out th herbs for whatever combination sounds good to you and you have easy access to. Add some sautéed mushrooms. Drop dollops of ricotta over the top instead of mozzarella. Make it your own and enjoy! Preheat the oven and pizza stone to 500 degrees, allowing it to maintain that temperature for at least 30 minutes. Meanwhile, sprinkle a large piece of parchment paper with the cornmeal. Stretch and roll the dough into a 12-14 inch circle. Brush the outer edge with olive oil. In a small saucepan, melt the butter over medium heat. Stir in the garlic and cook until fragrant, about 1 minute. Stir in the flour and pepper and cook, whisking constantly, until the flour has turned very light golden-brown, about 1 minute. Slowly whisk in the milk and bring to a simmer, stirring often. When it thickens slightly, remove from heat and stir in the Parmesan cheese. Season to taste with salt and pepper. Spread a thin layer of the white sauce over the pizza dough (using about 1/2 cup of the sauce). Scatter the chicken and onions evenly over sauce, and top with the shredded mozzarella. Transfer to the oven using the parchment paper, and cook about 10-12 minutes, or until the crust is golden-brown and the cheese is melted and bubbly. Remove from the oven and allow to cool 5-10 minutes. Sprinkle with the fresh herbs, slice, and serve with remaining white sauce. Mmm, that looks so yummy! Looks healthy too. Do you happen to know the calorie count per slice? This looks so pretty! It sounds delicious too! I love pizza...most all pizzas! This one will definitely be added to the 'make' list! SO refreshing! YUM! This looks so good and almost too pretty to eat. I have this recipe ripped out to try! It looks so good! I'm a sucker for white pizza...it was always my favorite when I was little. And it still is. Ever and anon. I LOVE white pizza. Great recipe. You always have such great recipes. 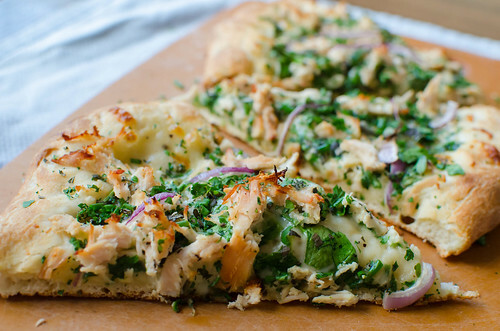 I love chicken on pizza and the chicken + all those fresh herbs sound so fresh and summery! I'm pretty traditional with my pizza, but I do love a white pizza. The addition of chicken makes it great, but the fresh herbs push it over the top. Can't wait to try this! Love this. I don't know why I don't make pizza more often than I do - well maybe because I can eat half of it on my own. This looks like a great version. I really love chicken on pizza.